Mwnt is a very small community and ancient parish in south Ceredigion, Wales, on the West Wales coast about 4.5 miles (7.2 km) from Cardigan. It lies on the Ceredigion Coast Path. It gets its name from the prominent steep conical hill (Foel y Mwnt), a landmark from much of Cardigan Bay, that rises above the beach to a height of 76m (249 feet), and was formerly anglicised as Mount. 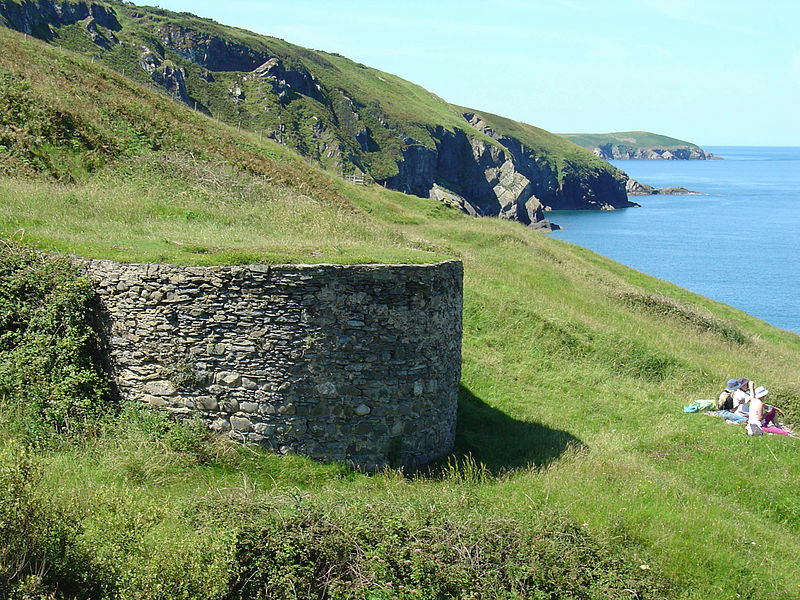 Mwnt was the site of an unsuccessful invasion by Flemings in 1155. Its defeat was celebrated, at least in the eighteenth century, by a games meeting on the first Sunday in January known as "Sul Coch y Mwnt" (Red Sunday), commemorating the blood shed on that day. Within living memory human bones and skeletons have been exposed in the area. A nearby brook is called Nant y Fflymon (Flemings' Brook). The Church of the Holy Cross (Welsh: Eglwys y Grog) is an example of a medieval sailor's chapel of ease. The site is said to have been used since the Age of the Saints, but the present building is probably 14th century. It has an example of a 12th or 13th century font made of Preseli stone. 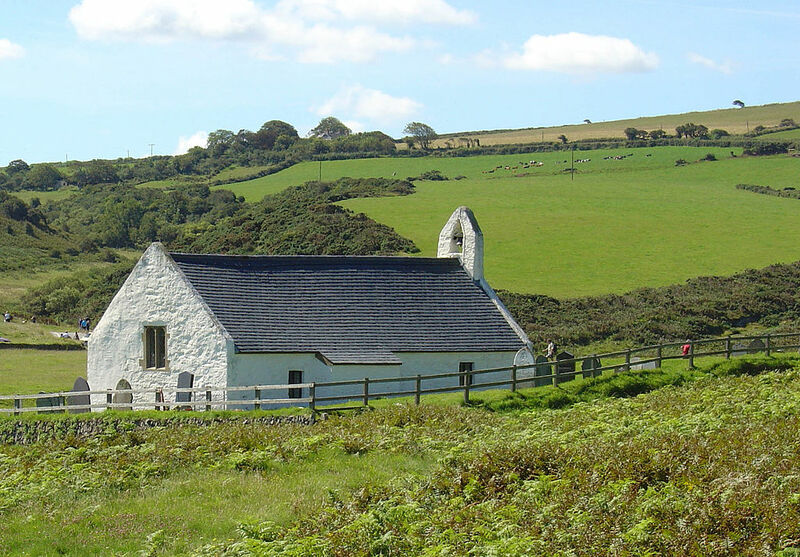 Mwnt was a civil parish in its own right for several centuries, but before the 17th century it was a detached chapelry of the parish of Llangoedmor. Since 1934, it has been part of the parish of Y Ferwig. The church is a Grade I listed building. When work ceased in 1286, Flint Castle had an inner ward and an outer bailey. They were separated by a tidal moat and were connected with gatehouse and drawbridge. A plantation town was also laid out beyond the outer bailey. The inner ward had three large towers and a detached keep. This isolated tower protected the inner gatehouse and outer bailey. In total expenditure, Edward I spent £6068.7.5d. creating the fortress and the town, a great deal of money today. Flint, which was sited on the western shore of the River Dee estuary, could be supplied by river or sea. Its harbour was protected by a defensive wall. The castle lies opposite to the English shore and Shotwick Castle in England. Before the river's course was drastically changed in the 18th century, passage across the estuary at this point could be made directly by boat at high tide or by fording at low tide. The castle is based on Savoyard models where one of the corner towers is enlarged and isolated. This independent structure served as both corner tower and keep or donjon, like at Dourdan, France. Flint's keep has been compared to the donjon at Aigues-Mortes, France. Edward I may have been familiar with Aigues-Mortes having passed through the fortress on the way to join the Eighth Crusade in 1270. An alternative possibility is the influence of Jean Mésot on James of Saint George, Mésot having worked in Southern France before influencing Saint George in Savoy. 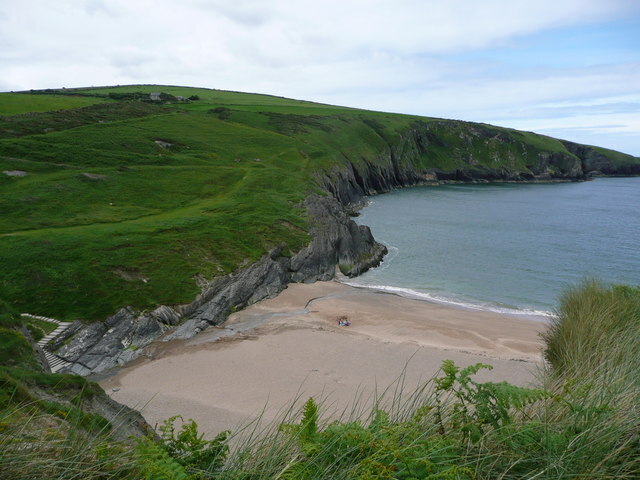 Mwnt is known for its popular beach. 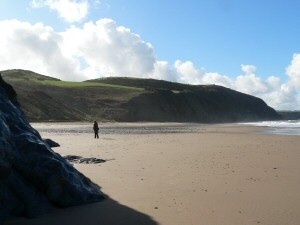 In 2011 The Daily Mail placed Mwnt top of its list of "Europe's top ten loveliest hidden beaches". The beach has earned a Green Coast Award (an award similar to a Blue Flag beach Award but for rural beaches). Swimming conditions are considered safe at Mwnt but there is no lifeguard service. The Irish Sea off Mwnt is rich in wildlife, being a regular summer home to dolphins, seals and porpoises. The beach (but not the church) is owned by the National Trust, who exercise a conservation remit over both. When visiting, a walk to the top of Foel y Mwnt is a must, take in the panoramic views over Cardigan Bay and see if you’re lucky enough to catch a glimpse of the mountains of Snowdonia in the distance. Dolphins can often be seen playing in the bay, with Mwnt locally recognised as one of the best places to regularly spot them. Every summer the team of National Trust rangers host Dolphin Watch events to gather data to assist with monitoring the population. Located on the Ceredigion coast, a few miles north of Cardigan town centre, you’ll drive down the winding country lanes to be presented with dramatic views over Cardigan Bay upon arrival. To reach the beach there is a series of steps leading down to the sheltered sandy bay. You can also reach the beach by walking the local stretches of Wales’ Coastal Path. On site facilities include the National Trust car park, toilets run by Ceredigion Council and a kiosk selling ice creams and all those little essentials you need to enjoy your day on the beach. Penbryn is a small village near the coast of the Welsh county of Ceredigion. It is about 8 miles (13 km) ENE of Cardigan, between the villages of Tresaith and Llangrannog. Standing in a field between Penbryn and Tresaith is the 6th century Corbalengi Stone. This 1.4 metre high monolith is believed to date from the post-Roman period and carries the inscription "CORBALENGI IACIT ORDOVS". The stone was first noted by Edward Lhywd in 1695 who described it as being in a field near the church. It was originally associated with a cairn of smaller stones beneath which was discovered an urn of ashes and some Roman coins. The final word 'Ordovs' of the inscription (after IACIT, "lies") is believed to refer to the Ordovices tribe of North Wales, with the suggestion that the stone was carved by local tribes in honour of a member of the Ordovices who had settled in the area. The Grade I listed church of St. Michael is of particular interest due to its medieval slate roof. The location of the church on a promontory above the sea is said to be from where Penbryn, meaning "Hill Head", derives its name. The church stands in a circular churchyard, suggesting its construction on a previous Druidical site, tradition being that this would leave nowhere for the devil to hide. The church is built of local stone, with a 13th-century nave, a 14th-century chancel and a 17th-century porch. The church was renovated in 1887 and 1957. The ancient Llanborth mansion, owned by the Vaughan family, was on the site of the current farmhouse next to the beach car park, whilst the Tudor mansion of Duffryn Hownant lay inland, higher up the valley. No evidence of either now remains. In the 18th century, Penbryn was well known as a landing place for smuggled goods, being described as a "dark country" by the Methodist leader Howell Harries on a visit to the area in the 1740s. The wooded valley through which the river Hoffnant flows to the beach is known as Cwm Lladron ("Robbers' Valley") to reflect this. During the 18th century the beach was also used as a landing place for fishing boats and trading vessels, including those bringing lime from south Pembrokeshire for use as fertiliser on the acidic soils of Ceredigion. This trade had ceased by the 1860s due to the exposed and hazardous shoreline. During the 19th century the Penbryn area was predominantly Nonconformist in religious persuasion, and in June 1843 during the Rebecca Riots, the vicar of the parish received a letter from "Rebecca" threatening to "cut off your arm and your leg and ....burn all that you have" should he refuse to return a family bible taken from a poor parishioner who was unable to pay his tithes. Discontentment with the church and the tithe system continued throughout the 19th and early 20th centuries, and there was anti-tithe rioting in the 1880s and 1890s. This resulted in regular requests by bailiffs visiting the area to collect tithe monies for police protection against attack. One such incident occurred on 19 March 1889, when police and balliffs were set upon by an angry crowd wielding pitchforks and a knife. Traeth Penbryn is a popular 1.5 mile long sandy beach near the village, with a car park. It is owned by the National Trust, and was used as a location for filming of the James Bond film Die Another Day. There are several caves at the north end of the beach and at low tide a further large sandy bay can be accessed along the beach to the north and the village of Tresaith can be reached to the west. Penbryn lies on the Ceredigion Coast Path with steep routes along the cliff tops leading 1.8 miles NE to Llangrannog and 1.6 miles west to Tresaith. This beautifully secluded sandy cove lies down leafy lanes, lined with flower-covered banks. Assistance dogs are welcome.